1. Mineral Vacuum Pump oil – traditional oils made by refining crude oil – still being used by those who haven’t woken up to the countless benefits that synthetic oils offer. 2. Semi-Synthetic Vacuum Pump Oil– Also known as ‘blends’- made by mixing mineral and synthetic oils – not recommended for vacuum pumps. 3. Synthetic Vacuum Pump oil – made by advanced refining process of the base oil in which individual molecules of the oil are customized to the extreme demands of the vacuum pump. DID YOU KNOW? 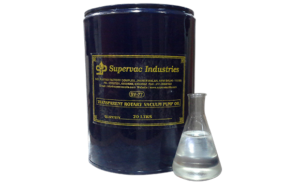 Supervac Industries is the only company in India manufacturing state-of-the-art synthetic vacuum pump oil with the brand name SV-77. 1) Mineral oil tends to turn viscous (thick) at low temperatures, taking time to circulate within the pump. This causes friction, and therefore, wear within the vacuum pump. Once the vacuum pump runs for a few hours, the oil inside tends to heat up. Mineral oils under such conditions tend to go thin and runny giving no lubrication to the pump parts. SV-77 molecules, on the other hand, have been engineered for high-temperature stability. So it retains its viscosity and lubricity even in very hot conditions. Furthermore, it is designed to protect the vacuum pump from deposits and prolongs the vacuum pump life. Performance of SV-77 is exceptionally robust at both low as well as high temperatures, which is rare in vacuum pump oils. This protects the pump from unnecessary wear and tear thus saving the user from loss of money and precious time wasted in the maintenance of the pump. 79% less maintenance required by using SV-77 synthetic vacuum oil. 2) Mineral vacuum oil is made through the process of hydrocracking crude oil which eliminates most of the impurities – but not ALL impurities. This means that the offered mineral vacuum oil still contains a large amount of sulfur, reactive, unstable hydrocarbon molecules and many other unwanted contaminants. Under extreme working conditions of the vacuum pump, these contaminants turn into sludge and harm the pump. Working life is greatly reduced. 3) During the initial working of the vacuum pump, mineral oil is much thicker and sluggish. Hence it circulates much slowly and is unable to deliver fast vacuum. The pump has to work extra hard at such times which lowers its efficiency considerably. Compared to this, SV-77 vacuum oil needs no time to ‘wake up’. It delivers a fast vacuum, thereby increasing the pump efficiency. When selecting vacuum oil for your pump, do so after making sure that it will deliver the full value of its cost and at the same time protect your valuable pump. The oil is not just meant to create sufficient vacuum for your process. Its long-term effect on the pump & the maintenance just cannot be ignored. With science and technology developing at such a fast pace, it makes perfect sense to let go of outdated products like mineral vacuum oils. Also, latest technology is no longer confined to just Europe and the U.S. Technologically advanced Indian products like our SV-77 have done us proud. Along with supply to many major Indian industries and the Defense Department, it is currently being exported to 17 different countries of the world.